I was up late channel surfing one night when I happened to come upon the very beginning of one of those TV coin shows. 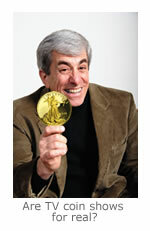 The host was quickly previewing several of the coins that would be discussed during the show. I must admit, my annoyance swelled up just as quickly! The preview prices were much higher than I would have expected. I almost immediately changed channels. But instead, I hit the record button and committed myself to watching it later. I was curious – just not that curious at the time. Well, I finally took the time to watch it… My reactions? I was dismayed, yet impressed. I was shocked, yet interested. The dismay and shock came mostly from pricing. There were clearly too many instances where you could purchase similar coins elsewhere and spend much, much less. In the end, I saw many nicely packaged coins but I couldn’t find a single one I’d be “smart” to buy. There are too many excellent coin dealers out there. I know I could get the same or better coins and spend less while feeling so much better. And it’s the coins, not their wrappers, that interest me. Yet… During the show and even later, I DID feel some excitement in wanting to buy coins. Part of those interested and impressed feelings I described earlier no doubt came from their marketing savvy. They also had decent knowledge of coins that helped build their “case” for buying. I almost hate to admit it but their inventory, their offerings and, you have to say it, their unique approach to selling struck accords somewhere inside me. In the end, I think you can’t debate the fact that some of these TV coin shows actually bring new collectors into the market. That’s a good thing. As they gain experience, these new collectors will quickly learn there are local and other established coin dealers to help build their collection while suffering less of a pain in the wallet. And for coin dealers, it’s possible to extrapolate and personalize some of the positive things these TV coin shows and companies do and apply them to one’s own business. For me? Well… I may watch more of these coin shows down the road. I’ll never pay the extra money for some of the nice display boxes or for overpriced coins. But hey, the shows are about coins and they’re not the worst entertainment on TV. Where is the fun that started coin collecting?today everything seen on today is slabbed and rated. Where does this take the hobby if nothing else is worth having?